A masquerade ball inspires a mysterious air while displaying the decadence of the Venetian renaissance, where beauty and charm reigned. On Friday, Oct. 19, the Emery Village BIA hosted the fourth annual Emery Charity Gala. 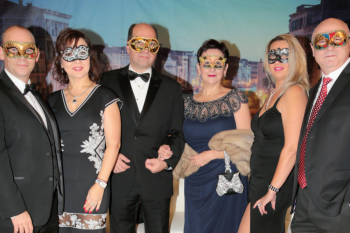 Attended by more than 350 community members, the evening took on the exquisiteness and looks of a grand Venetian carnival. It was a night of hidden surprises. Long gowns, period pieces from the mid-1800’s, formal attire for the men were worn. And many attendees didn’t reveal their true identities, wearing crafted artisan masks. Following a lavish four-course dinner, the energy in the room peaked and everyone danced to the awesome sounds of the Sensations Showband. The Masquerade theme dominated the Venetian photo area, and only imagination was needed to immortalize the moment. Councillor Giorgio Mammoliti briefly addressed the revellers and was able to highlight some of the progressive initiatives and developments taking place in Emery Village today. “Progress is being made every day. 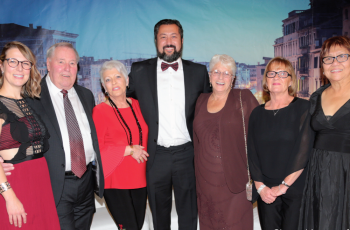 I am so proud of what we have been able to create and accomplish with the help of business, residents and the city.” The immense and popular auction tables assisted in raising money for the various charities supported by the BIA. “Whether it is the new Humber River Hospital, Children’s mental health or the seniors that reside in Emery and need of assisted care, we are there for them,” stated the Emery Village BIA board of directors. In addition to helping raise much-needed funds for community projects, the Gala was also the venue to present the all-important Emery Business Awards to deserving local companies that have proven leadership in their fields. Local businesses were nominated in a number of categories. Please look to the two page spread on page 4 and 5 to see the 2018 Emery Charity Gala business award winners.